The Jubilee partners have announced a planned halt of oil production offshore for 21 days. 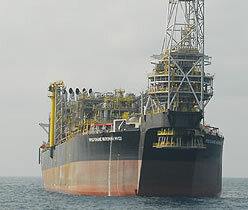 The suspension of production is to make way for routine maintenance of the Floating Production, Storage and Offloading (FPSO) platform, the FPSO Kwame Nkrumah. The facility, currently moored at the Jubilee Oil Field in a water depth of 1,100 metres, has been in service for three years and has so far produced 77 million barrels of oil as of the close of production activities offshore yesterday. The planned shutdown is slated for Friday, September 20, 2013. The General Manager of Tullow Ghana, lead operator of the Jubilee Field, Mr Charles Darku, said, “We embark on this exercise as part of our culture of adhering to world-class standards of operational performance management to ensure that the vessel operates at its optimal level and over its projected life span.” He said the Jubilee partners were committed to adopting proactive preventive measures, rather than reactive, whereby the operator had to carry out any maintenance when there was a defect or breakdown. Mr Darku said a critical aspect was the building of a robust industry which could be counted among the best in the world. Asked if it would not affect the target operation to rake in revenue for the partners and the state, he said the planned shutdown had been factored into the plan and forecast of production for the year. “This is necessary for safety reasons and it is normal practice in these circumstances,” he said. Mr Darku said the maintenance activity would include vessel inspection and cleaning and replacement of safety critical equipment. He said the move was in line with its obligations for external class certification and adherence to global maintenance and integrity standards used throughout the oil and gas industry. The partners said there would also be a team which would be moving personnel between Takoradi and the location of the FPSO Kwame Nkrumah to undertake the different aspects of the maintenance works. He said the partners were undertaking the maintenance exercise with support services from a variety of upstream oil and gas service providers. The FPSO has the capacity to process 120,000 barrels of oil per day and has a storage capacity of 1.6 million barrels, with an associated gas production capacity of 160 million standard cubic feet a day.